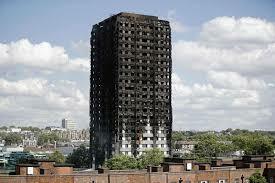 Neither oversight, negligence, nor malfeasance lies at the root of the Glenfell Tower fire in West London. Strip away the sickening obfusaction and platitudes, peddled by the usual coterie of confected politicians, and the roots of this disaster lie in the virulent disdain, bordering on hatred, of poor and working class people by the rich in a society which in 2017 is a utopia for the few and a dystopia for far too many. What will future historians say about a culture in which there is more than enough money to pay for nuclear weapons, to finance the bombing of other countries, to fund tax cuts for the rich, but not enough to provide decent housing for people whose only crime is that they happen to be poor and on low incomes? Given the scathing nature of the evidence, it’s a fair bet that the verdict issued will be a scathing one —and rightly so. No more living in a country in which cruelty has been raised to the level of a virtue and compassion relegated to the status of a vice, in which foodbanks, benefit sanctions, zero hours contracts, homelessness, and crumbling public services are justified on the basis of moral rectitude and fiscal responsibility, when in truth they are symptoms of the class war unleashed by the Tories on working people and which up to now working people have been losing. The hollowing out of the state, deregulation, the near free rein accorded to property developers and private landlords, all at the expense of people’s wellbeing and safety, is tantamount to a crime committed by the rich people who govern us in the interests of other rich people. Don’t politicise the Grenfell Fire, they tell us. Are they serious? Are they having a laugh? This event is verily dripping in politics. Indeed it could not be any more political, coming as it does as the logical conclusion of decades of under investment in social housing that is a badge of shame and refutes any claim by Brexit Britain to the status of a civilised country. The one hope we can cling onto is that despite the inordinate and sustained efforts by the Tories and their rancid media cohort to pit working and poor people against one another in recent years — Muslim against non-Muslim, low waged against unwaged, migrant against non-migrant, refugee against native — it has failed. Out of Grenfell, along with the recent terrorist attacks in Manchester and London, has come incontrovertible evidence of the innate solidarity of people of every background, ethnicity, faith, and creed when the chips are down. The outpouring of kindness, support, and humanity in response stands as a rebuke to those who want us to believe there is no such thing as society, that we are not connected by a common humanity but instead are merely a vast agglomeration of individuals, just like so many atoms spinning in the air. Then, too, as a further rebuke to these rotten Tory values we have our emergency services. Made up of men and women who have no hesitation in risking their lives when tragedy strikes, they deserve better than a government of the rich, by the rich, and for the rich — and so do we. They stand in sharp contrast to a Prime Minister who cannot even summon the decency to face angry and traumatised residents during her recent visit to the scene of what bears all the hallmarks not of a disaster or a tragedy but a crime. In memory of those who perished and whose deaths are indistinguishable from the fact they were poor and working class, let Grenfell be the line over which Tory greed and mendacity does not pass. Yes Theresa May you are right: enough is enough. Will We Actually Leave the EU in the End? Seven Years in the Green Party - What Now? How Long can the Tory Government Survive?